This summer The Brick Theater in Brooklyn, New York will debut Adventure Quest – a play built around PC adventure gaming of the 80s and early 90s. The production projects vintage game graphics onto the stage, uses 8-bit era music and an EGA color palette theme for set pieces and costumes. The story is about a generic Hero type who goes out to fight the dreaded Octopus Cult and win the love of a Peasant Girl. "King's Quest is definitely the primary influence and like the Sierra games in general, like Space Quest and Quest for Glory – all the ones where you had a guy like walk around and you type some commands," co-producer Chris Chappell told us by phone today. 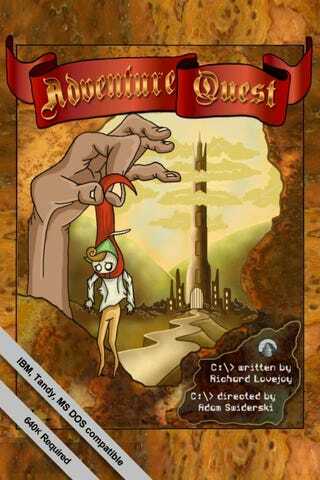 Like Homestar Runner's Peasant Quest spoof game, Adventure Quest uses common conventions and pitfalls from PC adventure gaming to move the plot forward. Chappell described a scene in which the Hero finds himself in a cemetery with no idea what to do. In desperation, he randomly starts combining things in his inventory and trying to give them to a man he meets. Finally, and for no apparent reason, the man accepts a tea set, makes Cemetary Tea and the hero is allowed to continue on. Adventure Quest isn't just about being nostalgic and funny, however. "It has some interesting things to say," said Chappell. He explained that the play's debut is part of a series of plays in The Brick's Antidepressant Festival that all explore happiness and adjustment in the face of difficult or depressing situations. "[The Hero] gradually becomes self aware as the game goes on […] and he starts killing people," said Chappell, "It actually gets pretty dark." But without giving away the play's ending, he said, there is hope for the Hero. "Even in a world like that you can find your way." Adventure Quest hits The Brick June 2 for the Antidepressant Festival and will keep running from July 2 through July 25 as part of the Game Play theater showcase, which features three different plays that take place within or are built around video games. You can check out a cute text adventure the play's producers have put together here and get a walkthrough for it on the play's Facebook page. First step, off-Broadway theater, next mainstream musicals and then... the world!